These are some of the winners to the Museums + Heritage Awards for Excellence announced on the 15 May at a glittering ceremony at 8 Northumberland. 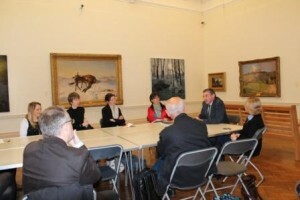 We held the 4th Rethinking the Museum networking event at Bury Museum on Monday the 13th of May. We had 10 people attending and we are thankful to both Tony Trehy and Sarah Evans for their contributions. The event kicked off with the visit to the museum shop, recently refurbished. The new design is effective and clear and has been developed on a minimum budget. The shop exhibits the work of local artists and craft makers and raises significant income through commissions from sales. Together with the international touring exhibitions the shop has challenged councillors’ attitudes to culture and has provided evidence of the economic impact and contribution culture can make to local economies. Tony gave an honest account of how the international touring exhibitions idea emerged out of the economic necessity of the cuts to the public sector. He described the process of negotiations with the Chinese and the challenges to UK museums’ stereotypes and fears for Chinese institutions and authorities. He did not fail to mention the practicalities of drawing up international legal contracts with more than one UK partners, and the heavy courier commitment for internationa touring shows to more than 6 different venues. The international touring exhibitions travel beyond the major cities of Benjing and Shanghai and are therefore making a significant impact in exploring new markets for British economy and cultural institutions . Such exhibitions also offer significant opportunities for staff development and an opportunity for many public art galleries to generate shows they may have been unable to deliver on their own. We were also introduced to the young curators who are working on new ideas for China, Japan and S. America, including a show on Cleopatra. International exhibitions are also a great way for young curators to practice their skills and knowledge.